Grant was helpful with information & advise, and the goods arrived promptly. Great company, product delivered on time at a great price! Air to Water heat pumps are a great way to heat your home and water from solar PV. The heat pump moves heat from the surrounding air into the water, it uses around 20-25% of the energy than if you were heating the water directly. So a 5Kw heat pump is using only 1.1Kw of power to get 5Kw of heat. These units can be easily installed inside or outside instead of using a boiler. The water can be used for radiators, underfloor heating, hot water etc. 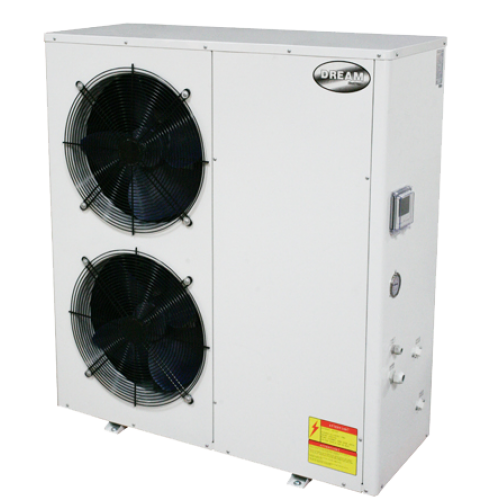 This Dream Air Source Heat Pump is extremely efficient and economical and is a very environmentally friendly way of heating your home or office. The Dream Heat Pump unit is ideal to provide heat for your radiators, hot water tanks and under flooring! Air source heat pumps are a very cost effective way of providing heating because of the high efficiency of the units, the output heat energy is up to 6 times the electrical input power, this is not possible with other means of oil or gas boiler heating. The energy is collected from the air outside and then transferred to the heat pump using the same technology that is used in air conditioning units and fridges. For each single KW used by the Dream Heat Pump, between 4 - 5 KW are returned back to the heat pump as heat. The Air Source Heat Pump can be connected to radiators, under floor heating, a pressurised water tank, a non pressurised water tank, a log stove system, a gas boiler system, a thermal store, etc. This Dream Air Source Heat Pump can be used for heating and cooling! The Heat Pump can be installed indoors or outdoors. The unit will even work in temperatures as low as -15°C. A Dream Air Source Heat Pump can save you up to 80% in operating costs compared to other forms of home heating. They are suitable for any type of house or office. The Dream Heat Pump requires much less maintenance than a gas boiler infact the heat pump requires almost no maintenance. There is no oil tank or LPG tank required and no gas connection is needed, also no flue needed as you do with oil or gas boilers. The Dream Air Source Heat Pump is fully CE certified. The Heat Pump has no harmful effect to the ozone layer. There is minimal installation required to install this Dream Heat Pump, they are very easy to install requiring flow and return plumbing connections and one electricity connection ideally connected to your fuse board. This Dream Heat Pump has been carefully manufactured to ensure the customer does not have to spend many hours installing the item.